I saw Rent last night. The last time I saw the musical was nearly two decades ago in London. About halfway through, the tears started falling and they basically didn’t stop. It was cathartic. Aside from the actors’ beautiful voices, for me, it was so moving because the message seemed to pertinent with the world today. It was such a great reminder that it’s the people that you love and surround yourself with that make each day more special and worthwhile than the next. Sometimes we get so distracted by the noise that it limits our ability to enjoy what we have. I’m guilty of that. Writing novels has its highs and its lows. For anyone that has queiried an agent, they now understand what “tough skin” really means. But it’s all part of the process. I’m working on my second book, CURTAIN RISING, and was so lucky to be selected into the Pitch Wars Setting Workshop and have my first 500 words reviewed. I’m so thankful to have some great critique partners; everyone adds value in a different way. For the Pitch Wars Setting Workshop, mentor and fabulous author Kelly Siskind provided some great feedback. Having someone who has gone through the process and has written some great books, is pretty great. So here is a sneak peek into the amazingly tough, yet wonderful, yet painful, yet amazing process of writing. This is my exerpt of CURTAIN RISING, with Kelly’s feedback. For those who don’t know Kelly’s work, check her out! A few years ago I started connecting with other authors on Twitter and it changed my life. I’m so glad that I’ve met so many great people that are in the same shoes, writing, editing, and supporting each other. My book, AMERICAN HONEY, got selected to compete in Query Kombat today! It is very exciting and yet, I’m so nervous. The winner will go on to compete in the next round, and so on. My competitor has got the goods too! Thanks for #TeamWriteyMcWriterFace, our team of authors selected to compete these next few weeks. What does honesty look like? There are so many faces of honesty. I’ve always been so interested in this topic, especially researching the life of an unreliable narrator for my new book. And then I happened upon a New York Post article, and that kind of brutal honesty has to make you smile…(story below). DEFINITION: An unreliable narrator is a narrator, whether in literature, film, or theatre, whose credibility has been seriously compromised. The reader/viewer often does not realize the unreliability until a contrast of the truth is shown by another character or event. The dishonesty that seems to hurt the most is when you are not honest to yourself. It’s amazing what we’ll do to protect ourselves sometimes, persevere, and move on. You see it all the time from fights between non-working women to working women, jobs, economy, even things like sleep. We try to convince ourselves that we don’t need it: we’re better off without it. When people are so honest to the point that it puts them in a bad light, and their actions clearly were incorrect but they still choose to put it out there, whether to help others or just help themselves…I find that so refreshing. Here is the New York Post article that made me smile. Obviously, I don’t condone his behavior, but it is hilarious. Christi R. Suzanne tagged me for the #777challenge. We met through an eye-opening author class at the Attic Institute with Whitney Otto in Portland. Since then, a few of us have stuck together to become great writing, critiquing, and commiserating friends. Check out her stuff and her novel MORT ADDENDUM…you’ll never look at Kool-Aid ever the same! Follow her at @christirsuzanne. The goal of the 777 challenge is to share seven lines from page seven of your manuscript, then tag seven more writers. 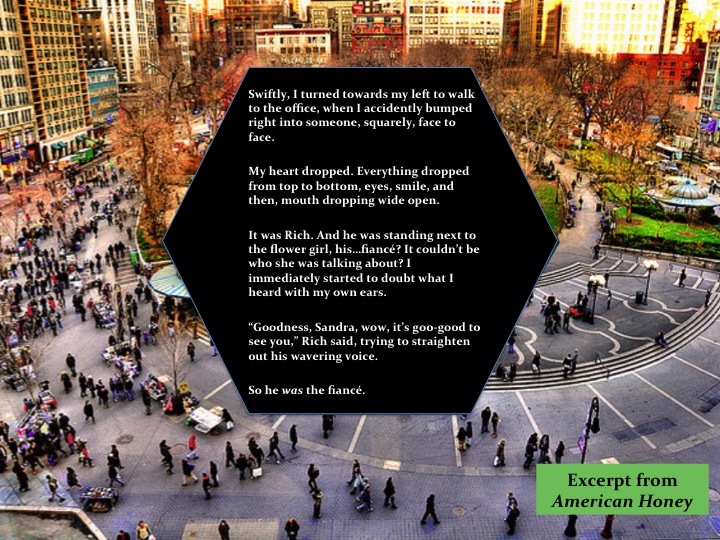 This excerpt comes from my finished novel, AMERICAN HONEY (currently looking for representation). AMERICAN HONEY is women’s fiction weaving together a journey in two timelines about coming-of-age, leaving your past behind, and then recapturing it. So on to the next, I challenge friends from The Writer’s Voice, Pitch to Pub and Query Kombat!